In the P A S T R Y world, there are three common meringues. Italian, French and Swiss. Italian Meringue: This method keeps the egg whites separate from the sugar at first. The hot sugar syrup is then slowly drizzled into and whipped with the egg whites to create a smooth, glossy, and bit airer meringue. Best use is for topping pies, cakes, and in mouses or ice creams. French Meringue: This method is whips the egg whites until just frothy, before adding the un cooked sugar bit by bit to create the meringue. Very smooth, and dense. Best use is for adding to pastries to be baked (folded in), and for mixing with whipped cream as a fresh topping. Swiss Meringue: This method uses a Bain-marie method (setting the bowl of egg whites & sugar over a warm pot of water) of cooking/heating the egg whites & sugar to a specific temperature and then beating vigorously to attain volume. Best use is for buttercream frostings-it is very fluffy! Today is A L L about the Italian Meringue (it's my personal favorite!). (Example of STIFF peak (final result). Image not mine. Here is the recipe! E N JO Y the fun it can be! And if it turns out right, which it should (leave me a comment if you had problems) the satisfaction it brings is AMAZING! You will need a candy or digital thermometer that can reach up to 240 degrees Fahrenheit, a high powdered hand held mixer or a standing mixer (such as a kitchen aid mixer), and a small pot for the syrup you'll be making. You will also need a scale to weigh out the ingredients, as it is important for accuracy. PLEASE READ ALL INSTRUCTIONS FIRST BEFORE ATTEMPTING THIS RECIPE FOR SUCCESS! First, measure out the water and sugar in the small pot. Put on stove at medium high heat, and keep an eye on it. Often check the temperature to see if it's close to 240 degrees. I recommend standing at the stove once the temperature reaches about 220, as it goes pretty quickly from there, and you wouldn't want it to burn. Second, measure egg whites (IMPORTANT: DO NOT get any egg yolk in the bowl, make sure to take out if it gets in there on accident). Start whisking the egg whites at the same time as the sugar/water solution is warming- this will insure they will both be ready at the same time. 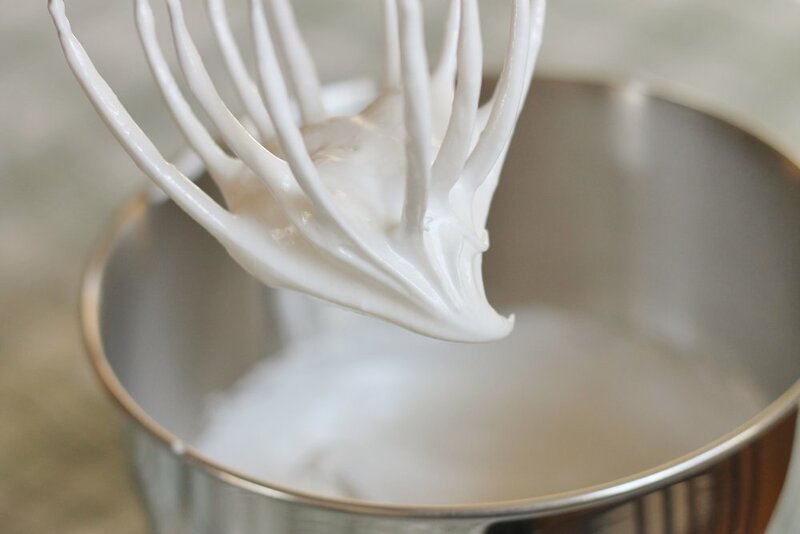 The egg whites should be whipped until frothy and soft peak (when you pick up the beaters or whip, they will look very bubbly and wet, but no egg white gel should be visible). Once they hit the soft peak stage, stop whipping until syrup is ready. When syrup reaches 240 degrees Fahrenheit, take off stove immediately. Start whisking your egg whites again, and S L O W L Y drizzle the hot syrup down the side of the bowl with the egg whites. Continue to increase your whisking/mixing speed as you continue to drizzle the syrup in the bowl. After all the sugar syrup has been added, add in the vanilla and salt, then let the mixer run on high speed until the bowl is room temperature (cool to the touch). To check to see if you did it correctly, turn your meringue upside down......if you followed all the steps- it should M-A-G-I-C-A-L-L-Y defy gravity. ENJOY! Of course, I'd love to hear how it went for you, so please write a friendly comment below!